The atomizer coil is the heart of your vaping setup. In many ways, the atomizer coil can influence your vaping experience almost as much as the e-liquid you use. Some atomizers work best if you inhale the vapor from your mouth to your lungs. Others work best for direct-to-lung inhaling. Some atomizer coils deliver pure, accurate flavors. Others create enormous vapor clouds. If you want to have the vaping experience that perfectly suits your tastes, you need to choose the right atomizer coil – and that’s what this guide will help you do. Here at Vapors Planet, we specialize in providing replacement atomizer coils for all of the most popular tanks in the vaping industry. We’ve seen it all, and we’ve learned quite a bit along the way. We’d like to share some information that can help you along the road to complete mastery of atomizer coils. How Does an Atomizer Coil Work? Aren’t All Atomizer Coils the Same? How Does the Design of an Atomizer Coil Affect the Vaping Experience? How Can I Tell Whether an Atomizer Coil Suits My Vaping Style? Why Should I Buy Pre-Made Coils Rather Than Building My Own? Why Does Vapors Planet Make Such a Big Deal About Authentic Coils? Are There Any Third-Party Atomizer Coils That Aren’t Counterfeit? Why Do Some Tanks Have So Many Different Atomizer Coils Available? Why Does Atomizer Coil Resistance Matter? Why Does the Number of Heating Wires Matter? From What Materials Are Heating Wires Made? What Are Temperature Control Coils? What Are Mesh and Strip Coils? How Do I Replace an Atomizer Coil? When Should I Replace My Atomizer Coil? How Can I Improve Atomizer Coil Life? Can I Clean and Reuse My Atomizer Coils? An atomizer coil is the large metal component at the middle of a vaping tank. A heating wire in the atomizer coil creates the vapor that you inhale, and a cotton wick keeps the coil wet by drawing e-liquid in from the tank’s glass reservoir. Since the atomizer coil is the component of your vaping setup that generates vapor, it has an extremely strong influence on what your vaping experience is like. An atomizer coil has a finite life. You’ll have to replace it every several days. When you press the activation button on your vaping device, electricity travels through the atomizer coil and causes the wire to heat up. The heat vaporizes the e-liquid suspended in the cotton wick wrapped around the wire. The cotton absorbs more e-liquid from the tank, making the heating wire wet again for your next puff. From the outside, most atomizer coils look basically the same. They differ from one another, however, in more ways than you might realize. Atomizer coils differ in wire resistance, wire material, the number of heating wires and the size of their wick holes – among several other factors. Although all atomizer coils do the same job, they do that job in dramatically different ways. That’s why switching to a different vaping tank can alter your vaping experience so greatly. Heating wire surface area: When you press the activation button your vaping device, the entire surface of the heating wire becomes hot. The greater the surface area of the heating wire, the more vapor an atomizer coil will produce. Heating wire mass: In most cases, increasing the surface area of a heating wire also increases its mass. As the mass of a heating wire increases, the wattage requirement of the atomizer coil also increases. That’s why the largest atomizer coils often have suggested wattage ranges exceeding 200 watts. If you operate a high-mass atomizer coil at a lower wattage, you’ll experience a lengthy ramp-up time before the coil generates a significant amount of vapor. Heating wire resistance: A wire is a bit like a water pipe. The wider a pipe is, the faster water can flow through it. Likewise, electricity flows through a thicker wire more easily. A high-mass atomizer coil typically has a low electrical resistance, which allows it to operate at a high wattage without requiring more voltage than your vaping device’s batteries can deliver. Coil airflow characteristics: When you puff on your vaping device, air enters the center of your atomizer coil through vents at the bottom of your tank. A tank and its atomizer coil need to allow plenty of air through to keep the heating wire from becoming too hot. Open airflow also helps an atomizer coil generate bigger vapor clouds, but the manufacturer must achieve a delicate balance because air doesn’t add flavor to the vaping experience. Increasing the airflow promotes the formation of larger vapor clouds, but it also dilutes the flavor of your e-liquid. With its small wick openings, this atomizer coil isn’t a good choice for cloud chasing. If you want to get an idea of whether you’ll like a vaping tank before you buy it, you should examine the tank’s atomizer coils. You can learn almost everything that you need to know about a tank by looking at the size of the atomizer coil and the size of the coil’s wick openings. Atomizer coils fall loosely into three different categories. Cloud chasing atomizer coils: These are the largest atomizer coils. They typically come three to a box and have the largest wick openings. The SMOK TFV12 Prince is an example of a cloud chasing tank. The big coils of the SMOK TFV12 Prince have 12 wick openings and up to 10 individual heating wires. Cloud chasing atomizer coils create the biggest vapor clouds. Because they allow so much air through, though, some people find them a little short on flavor. Balanced atomizer coils: These are the most common atomizer coils currently on the market. They typically come four or five to a box, and they’re a bit smaller than cloud chasing coils. Like cloud chasing coils, balanced coils work best for direct-to-lung inhaling. The Aspire Cleito is an example of a balanced tank. While it does produce large clouds, its airflow is a little more restrictive, so the flavor of the e-liquid comes through a bit more clearly. Mouth-to-lung atomizer coils: These are the smallest atomizer coils on the market. They typically come five to a box. In addition to the small size, you can identify a mouth-to-lung coil from its small wick openings. The SMOK Stick AIO is an example of a mouth-to-lung tank. A mouth-to-lung tank gives you a very flavor-forward vaping experience, but it produces relatively small vapor clouds. Mouth-to-lung tanks usually work best with thinner e-liquids. If your favorite e-liquid is a high-VG e-liquid, you’ll have the best experience with a tank that uses balanced coils or cloud chasing coils. At Vapors Planet, we specialize in selling guaranteed authentic pre-made coils for vaping tanks. Most people who vape prefer to use tanks; they’re convenient, reliable and provide a great vaping experience. Some people, however, prefer to build their own vaping coils from resistance wire. Since you can buy the materials in bulk, it’s very inexpensive to build your own coils. Building coils isn’t the right decision for most vapers, though, because doing so requires basic electrical knowledge and a lot of time. Installing a new coil in a vaping tank takes only a few seconds – but building a coil from scratch takes even experienced builders 20 minutes or more. For most people, coil building takes all of the fun out of vaping. At Vapors Planet, we sell nothing but guaranteed authentic coils with valid manufacturer identification codes. Authenticity is important because almost all vaping gear comes from China, where intellectual property law is lax, and cloning is rampant. In China, there are entire factories that exist solely to build knockoffs of name-brand vaping equipment. Some clones are so good that they’re almost impossible to distinguish from the original products. Other clones may look good, but their performance is nothing like that of the products they imitate. A few clones have quality control issues and are potentially dangerous. We believe that our commitment to selling only authentic coils helps to protect your safety and ensure that you have the best possible vaping experience. Avoiding counterfeit products also helps to support the companies that work hard to innovate and push vaping technology forward. Yes. Some vaping tanks such as the Kanger Subtank and the Aspire Atlantis have become so popular that third-party companies have created coils compatible with those tanks. A third-party coil isn’t a knockoff; it’s a valid product that you may enjoy using. A huge selection of coils has helped to make the SMOK TFV8 one of the world’s most popular vaping tanks. An overly large product lineup is potentially confusing to someone who doesn’t spend hours every day reading about the vaping industry. To help prevent confusion, some companies have decided to create a few tanks with many different coils rather than creating many tanks with one type of coil each. The SMOK TFV8 Baby is an example of a tank that’s become a wide and varied vaping platform in its own right. The TFV8 Baby has coils for cloud chasing, balanced coils, coils for small vape pens and more. If you own a TFV8 Baby and decide to buy a new vaping device, you can continue using your tank and simply begin using a different coil. A low-resistance coil operates at a higher wattage and requires a battery that can operate safely under a greater load. Before using a new atomizer coil with your vaping device, you need to know the minimum coil resistance that your device supports. If your device has a removable battery, you also need to know the battery’s continuous discharge rating. If the coil’s resistance is higher than your device’s minimum – and the amperage that coil would draw is below the battery’s maximum continuous discharge rating – the coil should be safe to use with your device. One common characteristic among experienced vapers is that many of them enjoy vaping hardware that produces big vapor clouds – and as we mentioned above, an atomizer coil with greater surface area generates bigger clouds. Increasing the number of individual heating wires is a great way to build a vaping coil with greater surface area. Companies like SMOK have taken that design principle to new levels with tanks like the SMOK TFV12 Cloud Beast King. The T12 coil for the TFV12 Cloud Beast King has 12 individual wires. You’d better believe that it produces some enormous clouds! Kanthal – an alloy of iron, chromium and aluminum – is the most popular material for heating wires in vaping. You’ll also find coils made from stainless steel, nichrome, nickel and titanium. Each material has its own benefits. A Clapton coil – named for the legendary guitarist – has a wire that’s twisted around a central core like a guitar string. Since a Clapton coil has a ribbed outer surface, its total surface area is greater than that of a single wire. Clapton coils thus tend to produce thick, full vapor clouds with a minor increase in total mass and ramp-up time. A temperature control coil changes greatly in resistance when it’s heated. A temperature control vaping device monitors the change in resistance and uses the information to estimate the current temperature of the atomizer coil. The most popular temperature control coils use titanium and nickel heating wires. To use a titanium or nickel atomizer coil, you need a vaping device that supports temperature control as those coils do not work in wattage mode. Some vaping devices also support temperature control mode with stainless steel coils. Unlike nickel and titanium, stainless steel coils work in wattage mode and temperature control mode. Mesh and strip coils are made from porous metal mesh rather than wrapped wires. Mesh coils became extremely popular in 2018 and will likely increase in popularity in the future. Using metal mesh makes it possible to create an atomizer coil with high surface area and low mass. Mesh coils thus generate very large vapor clouds without requiring high-wattage vaping devices. Aspire created the first radial coil, and a few other companies have since copied the design. A radial coil resembles the heating element of an electric stovetop. Like mesh coils, radial coils combine high surface area with low wattage requirements. 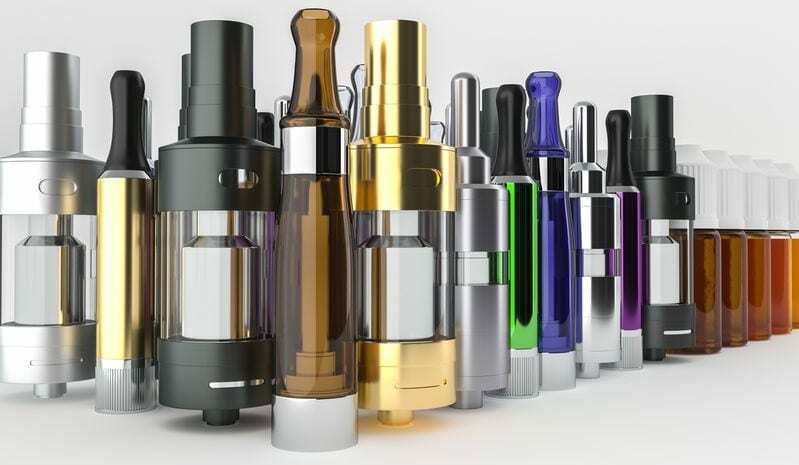 In most cases, you’ll replace an atomizer coil by unscrewing the bottom hardware of your tank. When you pull the hardware away from the tank, you’ll see that the atomizer coil is connected to the tank’s base. Unscrew and discard the coil. When you’re replacing your atomizer coil, it’s a good idea to clean your tank by rinsing and drying it. Remove the new coil from the package and wet each of its exposed wick openings with a bit of e-liquid. Screw the coil into the tank’s base. Reassemble and fill the tank. Wait a few minutes for the atomizer coil’s cotton wick to become completely wet before you resume vaping. You should replace your atomizer coil if you begin to detect a burned taste when vaping or find that the coil doesn’t generate as much vapor as it did when it was new. If you aren’t getting enough usage out of your atomizer coils, you’re probably using e-liquids sweetened with sucralose. Because sucralose doesn’t vaporize, it leaves deposits on your atomizer coil. Over time, those deposits become thick and dark, creating a harsh burned taste that ruins the vaping experience. If you avoid e-liquids with added sweeteners, your atomizer coils will last much longer. The second way to extend the life of your atomizer coils is by ensuring that they never become dry. Don’t vape until your tank is completely empty; refill the tank when the e-liquid no longer covers the coil’s wick openings. Don’t vape at too quick a pace; allow a few moments for the wick to become wet again after each puff. Some people find that it’s possible to make an atomizer coil last a little longer by cleaning it to remove the residue. A cleaned atomizer coil generally doesn’t offer quite the same performance as a new coil. By cleaning your coils, though, it may be possible to get a few more days’ usage out of each one and save a little money. Try cleaning your coils in a hot water bath or a bowl of vodka. 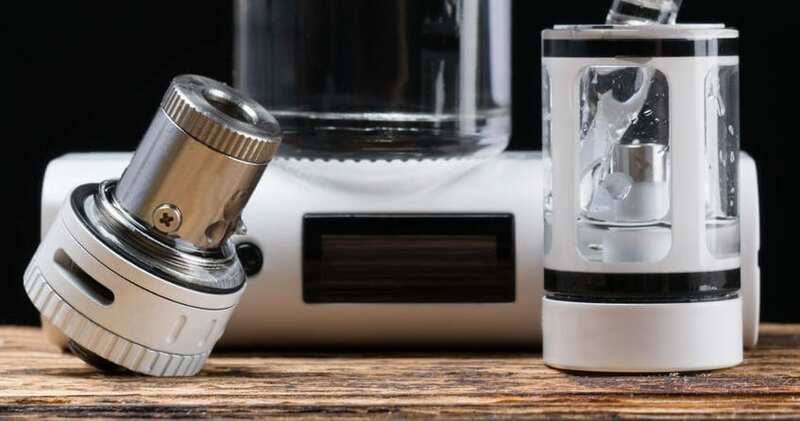 If you use vodka for cleaning your atomizer coils, rinse the coils with water when you’re done cleaning them. Allow your coils to dry for several hours before using them again.